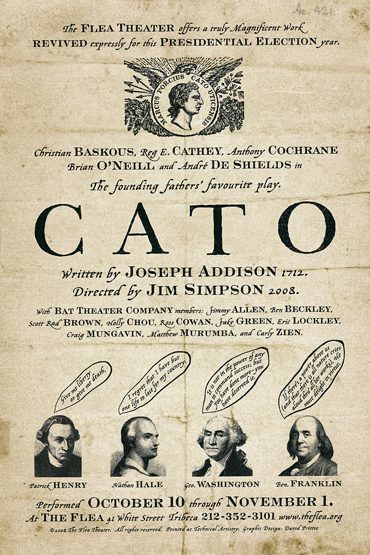 The Flea Theater presents a limited engagement revival of Cato, by famed English essayist Joseph Addison, beginnig October 10th. Written in 1712, the play was one of the most popular English plays of that period. The play is directed by Jim Simpson starring Obie Award winners André De Shields (Prymate, The Full Monty, Black Nativity) and Reg E. Cathey (“The Wire,” The Green Bird, Talk, Blue Door, White Chocolate). Opening night is slated for October 18th. Cato is based on the last days of Marcus Porcius Cato Uticensis (95-46 B.C. ), a Roman Statesman who took sides with Pompey in an unsuccessful civil war against Julius Caesar. The play takes place in the city of Utica, where Cato (played by De Sheilds) and a small Roman Senate stand ready to defend the last vestige of the Roman Republic against Caesar. The play delves into such themes as individual liberty vs. government tyranny, Republicanism vs. Monarchism, logic vs. emotion and Cato’s personal struggle to cleave to his beliefs in the face of death. In addition to De Sheilds and Cathey, the production co-stars Anthony Cochrane (The Coast of Utopiaand Cymbeline at Lincoln Center Theater; leading member of the Aquila Theater Company), Brian O’Neill (numerous roles at Yale Rep, New Jersey Shakespeare Festival, and North Carolina Shakespeare Festival) and Christian Baskous (Two September at The Flea; New York Shakespeare Festival’s Shakespeare on Broadway Series). Also featured will be five members of The Bat Theater Company, The Flea’s resident acting company. The design team includes Claudia Brown (costumes), Zack Tinkelman (set and lights), and David Prittie (graphic design). Joseph Addison (May 1, 1672 – June 17, 1719) was an English essayist and poet. He was a man of letters, eldest son of Lancelot Addison, and later the dean of Lichfield. His name is usually remembered alongside that of his long-standing friend, Richard Steele, with whom he founded The Spectator magazine. Cato is his most famous work. Jim Simpson is the Founder and Artistic Director of The Flea Theater (2004 Drama Desk cited for Downtown Adventurous Theater). Two-time OBIE-award winner, 2002 National Board of Review Excellence in Filmmaking, and cited for artistic leadership in Downtown New York by the Lower Manhattan Cultural Council. Jim has directed over 70 works for the theater and has also directed for film and television. Venues include nine seasons at the Williamstown Theater Festival, Alley Theater, Hartford Stage, Yale Rep, Actor’s Theater of Louisville, Eisenhower Theater at the Kennedy Center, Lincoln Center, Playwrights Horizons, EST, CSC, MCC, the London International Theater Festival and the Melbourne Fringe Festival. Jim was a child actor in his hometown of Honolulu, as a teenager worked with Jerzy Grotowski in Poland, and holds degrees from Keio University in Tokyo, Boston University School for the Arts, and the Yale Drama School. Most recently, Jim directed A. R. Gurney’s Crazy Maryat Playwrights Horizons and Will Eno’s Oh, The Humanity and the revival of Peter Handke’s Offending The Audience at The Flea. The Flea Theater, under Artistic Director Jim Simpson and Producing Director Carol Ostrow, is one of New York’s leading off-off-Broadway companies. Winner of a Special Drama Desk Award for outstanding achievement, Obie Awards and an Otto for political theater, The Flea has presented over 80 plays and numerous dance and live music performances since its inception in 1996. Past productions include Anne Nelson’s The Guys, A.R. Gurney’s O Jerusalem, Screenplay, Mrs. Farnsworth and Post Mortem, Roger Rosenblatt’s Ashley Montana Goes Ashore…, Kate Robin’s The Light Outside, Elizabeth Swados’ JABU, Talking Band’s The Parrot, Karen Finley’s Return of the Chocolate Smeared Woman, Glyn O’Malley’s A Heartbeat to Baghdad, Yussef El Guindi’s Back of the Throat, Julian Sheppard’s Los Angeles, Adam Rapp’s Bingo with the Indians and most recently, Will Eno’s Oh, The Humanity and other exclamations.